PURSUING pocket developments in mature neighbourhoods will be the forte of UOA Development Bhd to build up a stronger presence in the Klang Valley property market. UOA chief operating officer (development) David Khor says the Kuala Lumpur-based developer is also looking for opportunities to tap new growth markets like Penang and Johor. Although the company's cash pile of some RM300mil and borrowing of only RM10mil would mean it has leeway to resort to bank borrowings should it decide to make sizeable land acquisitions, UOA is not in a hurry to ramp up its gearing because it prefers to acquire strategic parcels. Khor says the 40 acres of undeveloped land in Bangsar South and another 60 acres in other parts of the Klang Valley will keep the company busy for the next seven years. “It is our strategy to continue with our business model of having smaller parcels of land and building good quality projects at our own pace, instead of rushing through projects which may compromise on quality,” Khor shares with StarBizWeek. Smaller plots of land will mean a shorter turnaround time of between two and three years (for high-rise developments); and being located in mature locations also ensures a better premium and margin for its properties. UOA projects yield net margins of about 30%. He says the other option is for the company to form joint ventures with landowners, and preliminary negotiation is underway for two potential sites in the Klang Valley. The UOA group also has a large presence in commercial development. 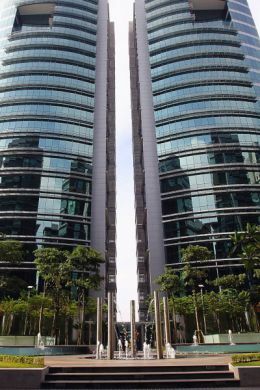 It has completed quite a number of office buildings of which six have been injected into the UOA real estate investment trust (REIT) which currently has an asset value in excess of RM1bil. UOA Ltd, which is listed on the Australian Stock Exchange, owns 68% of UOA Development and 47% of UOA REIT. Completed office buildings in Bangsar South – UOA’s flagship project. Khor says UOA has about 100 acres of undeveloped landbank in the Klang Valley, with 40 acres in Bangsar South, and the balance in Kepong, Taman Desa, Segambut, OUG and Glenmarie. Last year, it bought three parcels of land six acres in Sri Petaling, and 10 acres each in Segambut and Kepong. The company recorded RM850mil in sales in 2011 and is expecting double digit growth in 2012. On new project plans, it has lined up four to five projects worth a total gross development value (GDV) of RM1.5bil to be launched in the next12 months. Khor concurs with industry observers that the high-end condominium market is moving into a glut situation, with a high number of projects scheduled for completion these one to two years. “The over-supply situation is particularly acute in condominiums with a large built-up of more than 2,000 sq ft, when actually demand is greater for average sized units of between 1,000 sq ft and 1,200 sq ft,” Khor observes. He points out that the issue of affordability could be one of the reasons for this situation, following Bank Negara's directive to banks to decide on the quantum of loan approved based on a borrower's net income instead of the previous method of using gross income. “The imposition of a maximum loan to value ratio of 70% for third time borrowers has also impacted on the affordability level of property buyers. “In such a situation, there is a need for developers to plan for more average sized houses that are more affordably priced at around RM400,000,” Khor notes. Going forward, he says UOA would be focusing on that market range and designing its projects with more average sized residences to fit the affordability level of buyers. Khor notes that UOA is among a handful of local developers that have undertaken projects under the build-then-sell (BTS) system. Its two residential projects Villa Yarl and Halimahton were completed before they were launched for sale in 2007. It has also completed a few boutique residential projects including Villa Mont'Kiara in Mont'Kiara and One Desa Residence in Taman Desa. Khor says the company's flagship project is the 60-acre Bangsar South, an integrated mixed use development located on the former Kerinchi squatter colony, which is off the Federal Highway. The land was acquired at RM35 per sq ft back in 2005, and today, the market price has reached RM300 per sq ft.
Khor says Bangsar South will comprise 29 office blocks, a retail block, and seven residential blocks with an estimated gross development value in excess of RM8bil. So far the company has sold RM620mil worth of boutique office towers of 10 to 11 storeys to corporate buyers who will have the naming rights for the property. The selling price for the office space is around RM800 per sq ft while the asking rental rate is RM5.50 per sq ft. The residential properties were opened for sale since 2007 and so far RM476mil have been sold. Khor says UOA will be improving the infrastructure access between the residential and commercial precincts by widening the roads, and has upgraded the Universiti LRT station. Walking pavements and sheltered pavilions have also been built. 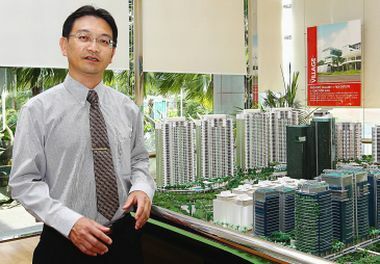 According to him, the Bangsar South project will continue to be the main growth driver for the company over the medium to long term. “Going forward, the development in Bangsar South will remain the company's focus as it will contribute positively to the company's bottomline over the next seven years,” he adds.